Sometimes I love to read random books that iBooks suggests from the free list. Don't get me wrong sometimes they are not the best books, but sometimes they can be excellent reads. This book was brilliant, it absolutely captivated my attention and made me need to know the ending and that for me is what makes a book! Abby's sister is sick and so Abby agree's, after much begging from her sister, to fill in at her job as a maid. She is only persuaded by the fact that the Billionaire who's house she is cleaning is working away and she won't have to see anyone, in and out with no-one the wiser. However, the billionaire has other ideas and has to visit town die to a family members death, stumbling onto the maid and becoming attracted to her. 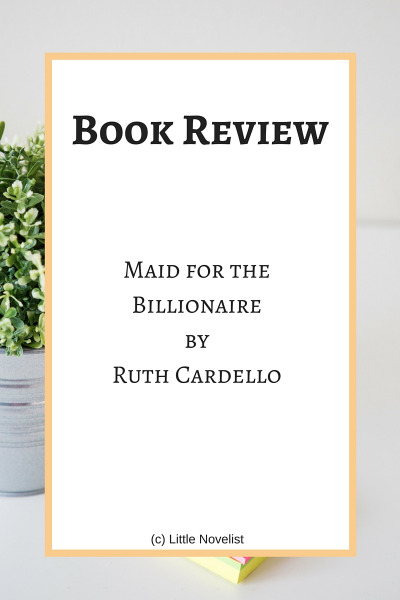 The billionaire, named Dominic, finds out that she isn't actually the maid but doesn't want her to leave so offers to pay her to stay, to which (as any normal lady would) she says no. He then resorts to blackmailing her to come to a few events with him before eventually taking her to China with him so that she doesn't leave. Abby half heartedly wanted to help Dominic because she see's herself as a fixer-upper. Long story short with no spoilers, everything works out well and they love happily ever after. I absolutely loved this book. Okay, so it had the romance cliche but thats what we all know and love about romance stories. Slightly different but totally traditional! Who doesn't love girl meets boy and they have a clash then fall in love - its the perfect story. I truly recommend it! Comment: For an easy read and a good romance novel this is perfect.